Since the Republican Party in Idaho decided to have closed elections, the number of registered Republicans has grown tremendously. One of the reasons for this growth is because Democrats and Independents are registering as Republican to try to ensure that the most moderate Republican will win. So what has this strategy done for Idaho? It has pushed us further to the right; it has skewed the data about what party people truly belong to and it has contributed to the idea that Democrats are a dying breed in Idaho. Democrats are not a dying breed in Idaho. Now is the time for all of us to stand behind our values and be proud Idaho Democrats. We have something special here in Idaho. Those who call Idaho home know there is no better place to live. As Governor Cecil Andrus once remarked, “The reason so many people live back East is because they don’t know any better.” North Idaho is rich in many things: rich in the resources of our lands, rich in the people we call friends and family, and rich in our values and ideas. Each of us has a unique perspective on life and what matters to us as Idahoans. Many of us share the same views and beliefs. Whether it is our faith, politics or the team we root for, there is more to unite us than to drive us apart. I am a Democrat because of the beliefs and values I hold. I believe people should show personal responsibility, and when people fail to do so, we need a government that will set the standard. We need a government that will promote a safe and secure society — one that promotes the prosperity of all people. I believe in community, a concept we have lost in our digital age where we are so connected, yet so far apart. I think government begins in the community and that strong community spirit is essential. I believe not in a large government, but rather in a competent government that utilizes our hard earned money to the maximum benefit of its citizens. I believe in giving our children a quality education that prepares them for an ever-changing work force without saddling them with crippling debt before they can even get their feet off the ground. I believe in capitalism and the entrepreneurship that has allowed so many Americans to pull themselves up by the bootstraps and work towards success earned through fair competition and a level playing field. I believe workers and companies should have a balance in bargaining power where neither can take advantage of the other. As Lord Acton said, “Power tends to corrupt and absolute power corrupts absolutely.” Most of all, I believe working families shouldn’t struggle to get by to provide for their families. Too many Idahoans are considered “working poor.” If you work hard and contribute to our society, you should be able to afford the basic necessities in life and provide for your family. While not all believe exactly as I do, these are some of the reasons I am a Democrat. I am a Democrat and I respect everyone in my community regardless of whether or not they share my beleifs. I believe everyone needs to have a seat at the table. We need Conservatives and Progressives; we need Republicans and Democrats of every shade of red and blue; we need citizens that will work together and find the best way for all of Idaho. While some of us are dreamers who put our foot on the gas, we also need realists to apply pressure to the brake when we move too fast. This is not to stop progress, but to cultivate lasting progress with a strong foundation in reality, fueled by the glory of our dreams. Our government is designed to move and progress slowly so that we can deliberate how best to move forward. How we govern and what we decide to do as a state and country require both Democrats and Republicans. While we all have our ideas and values, the answer often lies in the middle. Arriving at these answers requires us all to be civil. We must discuss our ideals with passion but also with logical reasoning. We must respect all sides of the issues and give each side consideration and understanding before we decide the best path to take. Only through reflection without judgment can we find the true answers, setting aside bias and stubbornness in favor of compromise for the good of all. Currently in Idaho, Republicans rule the roost, holding the majority of seats in our state legislature as well as our executive branch. There are lots of folks with their foot on the brakes, not willing to get behind the wheel and drive Idaho forward. I don’t dream of an Idaho that is purely blue or purely red. We need a balanced Idaho that offers all of its citizens a voice in their government. Currently in North Idaho, all our state legislative seats are held by Republicans. Our representatives have done a creditable job for North Idaho, and I respect many who have chosen to serve. However, I want representatives that will explore the other side of the coin. I want to see members bring Medicaid and other options to the table to cover the 78,000 Idahoans in the gap. I want people willing to discuss ideas to get working families into the middle class. I want Idahoans to work towards strengthening our schools and offering parents better options for their children both in school and through childcare options. Most of all, I want us to work toward building stronger communities here in Idaho. There are plenty of Democrats in North Idaho. However, many of you may feel like you cannot stand up and identify as a Democrat. Now more than ever, we need you to step up and be proud of your values. Only when we work towards having the sometimes difficult conversations about what matters to us will we be able to start to make changes. No one should feel ashamed because of their values and their chosen party. You should always be proud of where you stand and the values you hold. So please, be true to yourself and stand up as a Democrat if you are a Democrat or stand up as a Republican if you are aligned with Republican values. 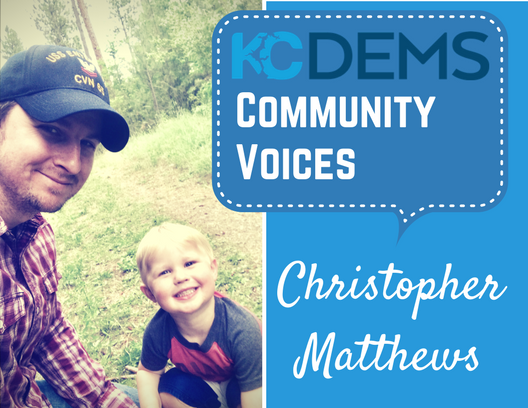 Consider your community and the values you hold as you reexamine your party registration. Does your party represent your values? We have an amazing community and our local Democratic Party is a party that allows everyone to share their thoughts and ideas, a party where everyone is welcome to sit at the table, regardless of how moderate or progressive you are. Your voice and your values matter. I hope all of us can stand up and show courage in working towards a balanced Idaho that works to find what is truly right for our communities. As President John F. Kennedy said, “A man does what he must, in spite of personal consequences, in spite of obstacles and dangers and pressures, and that is the basis of all human morality.” So I implore all of you to be courageous and stand for what is just and right, abandon old tactics that do not work, and be proud to stand up for your values. This is an excellent article for all of us in Idaho and across the country. We each need to assess “does our party represent our values.” Irrespective of party we should ask does an elected official or candidate represent our values. As individuals we need to define our values. As voters we need to be informed. Great article Mr. Matthews and important for all to read. This is a good article and raises a lot of really good points – I have struggled with the idea of registering Republican as it goes against everything I have been since I have been able to vote. That said, this entire “Alt Right” stranglehold that is currently upon us is really disturbing as it has the potential to hurt so many with so many of these people being associated with various hate groups – so really I am thinking that along with the points raised in this article what is needed is a plan for how we bring things back to a kind of sanity where people are not getting hurt by extremists. Perhaps is it possible to register Republican to vote in a primary but then switch back? Not sure if this can be done and this may be a bad idea….but just a thought. Another thing that happened is that there was at least one Democratic candidate in the last election who was an Alt Righter – thankfully the Sandpoint Reader pointed this out when they did their interviews but still….If we register Democrat and vote Democrat we need to be careful that the candidate in question is actually who they say they are. But really along with this is some sort of way to get the Dems out to VOTE – many of them did not in the last election. I am not “ashamed” to be a Dem in Idaho-I am AFRAID being a Dem in Idaho. I have experienced a lot of vandalism and personal insults because of identifying as a Dem. As for two sides? Today, there are not “two sides to be respected”. There is the side of our democracy, Constitution, and lack of hate, and there is the side against all of those things. Politics are not about “grey areas” these days. First, we have to regain the will of the people for what our Constitution guarantees and then to push the worst of us-the haters, the supremacists, the violent, true entitled (and I am not referring to poor people or minorities) and the greedy rich who have no empathy for anyone but themselves-back under the rocks and swamps that they have been lured from by the present monster in DC. Then, perhaps, we can begin to operate as sensible Americans again and discuss “both sides”. If there are any true Republicans still left in this country, make yourselves known by helping to rid us of this pestilence of pseudo republicans. Grit your teeth and don’t keep voting for them hoping that somehow they will represent you or anyone else in the 99%. Because if any of you think that this travesty is not going to take you down along with the Dems, you are being willfully ignorant and there is no way we can compromise with those who will not compromise. Wonderful article but I have to disagree with the notion of moving to fast. This is the type of thinking that drives progressives away from the party. I have been practising patience since I attended the 68 convention in Chicago. Matt, exactly what parts of the Bernie platform do you think need to be postponed for a later day. So so many of us came out of the woods last year as we saw a Democratic party that would live up to its commitment to the common folks. Certainly many democrats see utilitarian purpose in voting republican in primaries but there are so many who are just looking for a party that will be proud of past people like FDR. The status quo is a losing proposition for the party. Embrace the “new comers” who want a truly liberal party. Hi there. Sorry for the delay on publishing your comment. The publication and maintenance of these articles are done completely by volunteers. We do have a policy of moderating comments before they go live to avoid spam. I am one of the new comers that the local party has embraced. I am a Progressive Democrat, I want our party to be the champion of the Middle Class again. My notion that progress moves slow means that there needs to be progressives like you and me working to bring about progress, it will take time. I am in this for the long haul and I am ready to work the rest of my life to move Idaho forward. I stand by Senator Sanders’ platform now as I did in 2016. We all need to be stepping up now and working to make changes now, and we have got to be prepared to keep coming back, when we fail to make change, we must endure, time after time, because we deserve better, Idaho deserves better.